David Huddle will discuss his new novel, The Faulkes Chronicle. 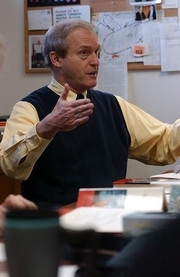 ABOUT THE AUTHOR: David Huddle taught for thirty-eight years at the University of Vermont, then served three years as Distinguished Visiting Professor of Creative Writing at Hollins University. He now teaches at the Rainier Writing Workshop and the Sewanee School of Letters. Huddle’s writing has appeared in The New Yorker, The American Scholar, Esquire, Harper’s, The Georgia Review, and Appalachian Heritage. His novel Nothing Can Make Me Do This won the 2012 Library of Virginia Award for Fiction, and his collection Blacksnake at the Family Reunion won the 2013 PEN New England Award for Poetry. ABOUT THE BOOK: A work of uncanny originality, David Huddle’s nineteenth book is the account of an extraordinary death trip taken by a charismatic and beloved woman, her husband, and an astonishing number of offspring, from infants to young adults. The Faulkes Chronicle explores how children grieve, and shows how the wit and courage of even the littlest brothers and sisters can be a source of resilience. David Huddle is currently considered a "single author." If one or more works are by a distinct, homonymous authors, go ahead and split the author. David Huddle is composed of 1 name.